Blood cells are continuously regenerated throughout life and are derived from a small population of hematopoietic stem cells (HSCs). In adults, HSCs are largely quiescent and primed to respond to various differentiation-inducing signals. Inability to properly sustain HSC homeostasis and function leads to the development of hematopoietic disorders; therefore, factors that regulate HSC formation and differentiation have been of great interest. Epigenetic modifiers have recently been found to control HSC function, indicating potential targets for functional reprogramming of mature blood cells; however, dysfunction of these enzymes is also associated with development of hematopoietic malignancies. Fan Liu and colleagues of the University of Miami Miller School of Medicine report that the type II arginine methyltransferase PRMT5 controls HSC and hematopoietic progenitor cell (HPC) homeostasis. Conditional deletion of Prmt5 in adult mice resulted in severe pancytopenia in the blood, bone marrow, and thymus. PMRT5-deficient animals exhibited an initial but transient increase in the HSC population but these HSCs were unable to restore blood cell populations in lethally irradiated animals, indicating functional defects. While PRMT5 deficiency initially triggered different effects in various hematopoietic populations, all HSCs and HPCs were eventually reduced. Hematopoietic cell loss could not be attributed to increased apoptosis, and PRMT5 deficiency distinctly affected activation/cell cycling of HSCs compared to HPCs. Liu and colleagues determined that the methyltransferase activity of PRMT5 is required for hematopoiesis, as viral-mediated expression of WT but not enzymatically-inactive PRMT5 in PRMT5-deficient bone marrow cells restored HSC functionality. Loss of PRMT5-mediated epigenetic regulation disrupted multiple cytokine signaling pathways and resulted in non-DNA damage-induced p53 expression in hematopoietic cell populations. Together, these findings provide important insight into how PRMT5-mediated epigenetic regulation contributes to the maintenance of adult hematopoiesis. 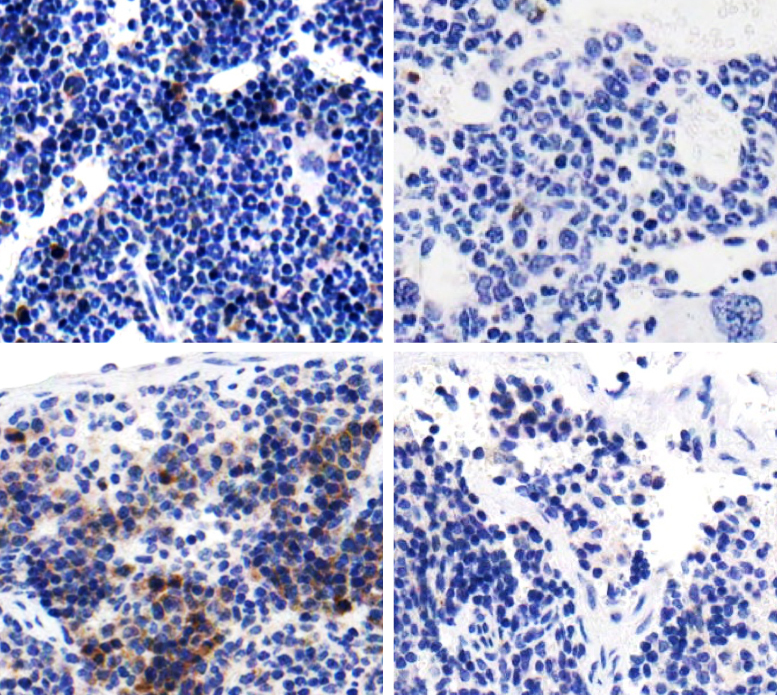 The accompanying image shows bone marrow (top row) and spleen (bottom row) from WT (left column) and PRMT5-deficient (right column) mice stained for phospho-ERK1/2. Note the reduction in phospho-ERK1/2 in PRMT5-deficient cells, indicative of reduced cytokine-mediated signaling. Citation Information: J Clin Invest. 2015;125(9):3532-3544. https://doi.org/10.1172/JCI81749. Epigenetic regulators play critical roles in normal hematopoiesis, and the activity of these enzymes is frequently altered in hematopoietic cancers. The major type II protein arginine methyltransferase PRMT5 catalyzes the formation of symmetric dimethyl arginine and has been implicated in various cellular processes, including pluripotency and tumorigenesis. Here, we generated Prmt5 conditional KO mice to evaluate the contribution of PRMT5 to adult hematopoiesis. Loss of PRMT5 triggered an initial but transient expansion of hematopoietic stem cells (HSCs); however, Prmt5 deletion resulted in a concurrent loss of hematopoietic progenitor cells (HPCs), leading to fatal BM aplasia. PRMT5-specific effects on hematopoiesis were cell intrinsic and depended on PRMT5 methyltransferase activity. We found that PRMT5-deficient hematopoietic stem and progenitor cells exhibited severely impaired cytokine signaling as well as upregulation of p53 and expression of its downstream targets. Together, our results demonstrate that PRMT5 plays distinct roles in the behavior of HSCs compared with HPCs and is essential for the maintenance of adult hematopoietic cells.